Conservative and homosexual: How do they go together? For members of the working group, Lesben und Schwule in der Union (LSU), this combination isn’t a contradiction. While demands for marriage equality and the right to adopt for homosexual couples is still being fiercely debated in the within party, there’s a lobby internal to the party, which is committed to just this. However, the LSU isn’t a recognized working group in all German states. Berlin and Brandenburg are exceptions. 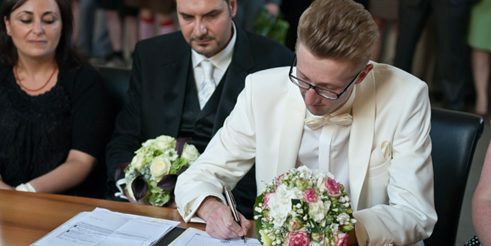 Martin Och is 21, he’s a member of the CDU – and he’s gay. “It’s part of me like my name is,” the education student says. He joined the working group in 2010. Martin has been the regional chairman of LSU Ost since the end of 2011. With 150 members, it’s the biggest regional representative of the national LSU. 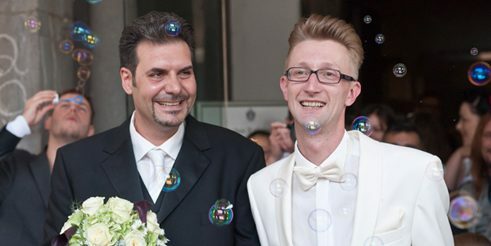 Heinrich and Salvatore sealed their “civil union” in June, 2011, in Cologne. Heinrich and Salvatore: “Hopefully the debate about tax equality will reach a good outcome soon … regardless of which party passes it. The LSU float at Christopher Street Day 2012 in Berlin. 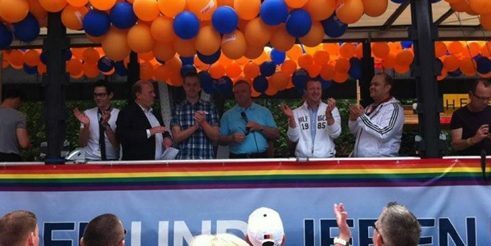 From left to right: Martin Och (Regional chairman LSU Ost), Kai Wegner (Member of the Bundestag, general secretary CDU Berlin), Stefan Evers (Deputy party leader and spokesperson for queer politics), Frank Henkel (Mayor and senator for the interior and sport in the city of Berlin), Jan-Marco Luczak (Member of the Bundestag), Matthias Steuckhard (LSU Berlin state chairman). This is also Martin’s argument for lobbying for gay and lesbian adoption rights. You would have to push for them both within internal party debate as well as on a societal level, in which both sides could present their arguments and reservations. “A democracy isn’t about pleasing everybody, it’s about finding the best solution for the majority of citizens. That’s what a big tent party is all about,” Martin says, holding his party to its promise of being one. To date, it’s primarily been the CDU/CSU that has been reluctant to hostile towards gay rights.